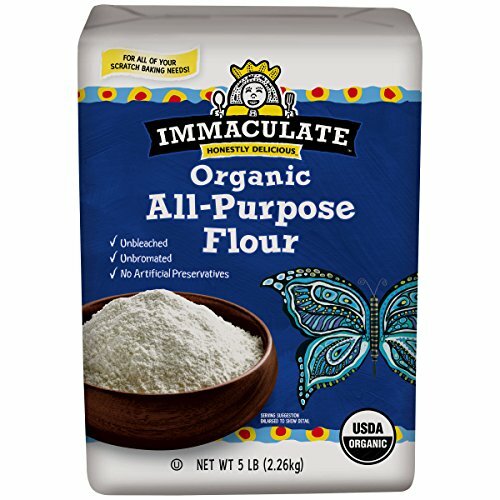 Immaculate baking company organic all-purpose flour, 5 pound.HONESTLY DELICIOUS: Honestly delicious and organic baking flour for all of your scratch baking needs. MADE WITH GOODNESS: All purpose flour is certified organic, unbleached, unbromated and contains no preservatives. WHOLESOME INGREDIENTS: We use only wholesome ingredients for our baking flour, so you can bake goodies you can feel great about. NON-GMO PROJECT ENROLLED: All of our goodies have been enrolled in The Non-GMO Project, and over half of them are verified. We consider making non-GMO-formulated goodies our most important Soul-cial Responsibility.